After ten eventful days of travel, I arrived safely in Tanzania on the feast of St. George– Friday April 23rd. This was one week later than planned, as ash from the eruption of the volcano Eyjafjallajokull in Iceland shut down British airspace moments after the first leg of my trip arrived in London on April 15th. I was well cared for in the UK by friends of friends. 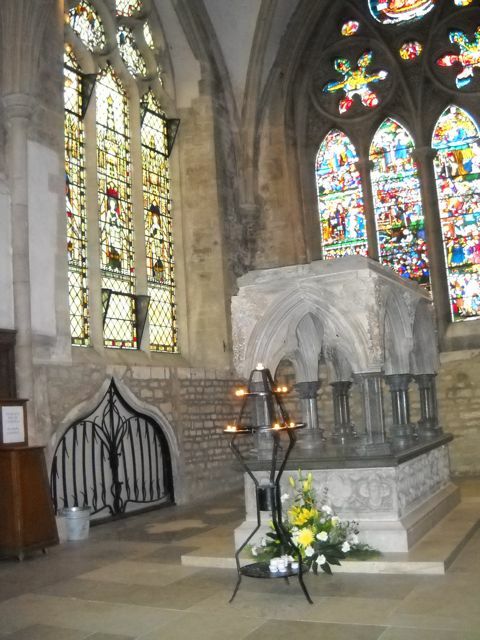 A highlight of my unexpected sojourn there was the opportunity to venerate St. Frideswide of Oxford at her reliquary in Christ Church Cathedral. Because of the delay, I was not able to spend a week in Mwanza as planned but instead headed directly to Dar es Salaam, where I have begun Kiswahili language study. God willing, I hope to continue language study here for several months, and begin work in Mwanza in late summer. Dar es Salaam is Tanzania’s commercial hub, its largest city on the coast of the Indian Ocean, and the seat of the Archdiocese of Irinoupolis headed by His Eminence Metropolitan Dimitrios. Mwanza, where I will be serving, is the country’s largest city on the coast of Lake Victoria, about 1,000 km northwest of Dar es Salaam– an eighteen hour journey by bus. Mwanza is the seat of the Archdiocese of Mwanza, headed by His Eminence Metropolitan Jeronymos. Both dioceses, like all Eastern Orthodoxy in Africa, are part of the Church of Alexandria and all Africa, headed by His Beatitude Pope Theodoros II. I have some internet connectivity now, as well as a phone number: +255 782 356 817. It’s free for me to receive phone calls (you can get a very good rate via Skype), so please feel free to be in touch! Tanzania is seven hours ahead of Eastern Daylight Time in the US. Thank you for your friendship, encouragement, financial support and especially for your prayers as I traveled. Thousands of people were stranded by the volcano, and some suffered greatly. By God’s mercy through your prayers, I was well cared for every step of the way. All is well here. I am only just beginning my studies of language and culture, so I will report more news when there is more news to report!